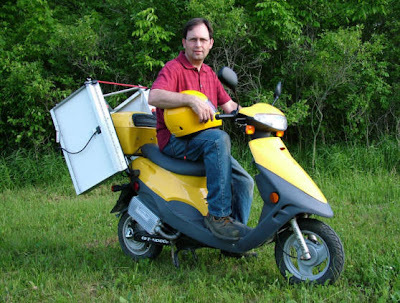 Don just sent the 2012 update for his solar electric scooter -- see below. Don's conversion is somewhat unique in that he added folding PV panels to the scooter so that it can charge while he is at work or in town. The scooter still flying...returned to Earth Day 2012 At University of Michigan, Flint. Scooter a hit again. Kind of humbling that the interest is still strong. Will be on the local TV 25 news in May. They are doing an ECO Fuel Story about people doing things to avoid purchasing gasoline. The scooter survived another winter outside. I took off the rear view mirrors and covered Scooter with plastic except for the solar panels this year. 14 miles into Flint for Earth Day and 14 back. No problems. The evening before I replaced one of the top cross locking bars that was bent the night before Earth Day last year when Scooter tipped over in the wind when I was out of town and a storm hit. I had hand straightened it, but decided to replace it this year. Replacement took less time than going to town to purchase a new piece of stock. For others with electric scooters, check you tire pressure. On the first after winter trip to town a couple of weeks ago, the light kept going to the second or third level down from full charge indicating a higher amp drain. This despite a full battery. Apparently only having 10 lbs of pressure in tires made for 40 lbs, does effect performance and subsequently range. That is about all for this years update. 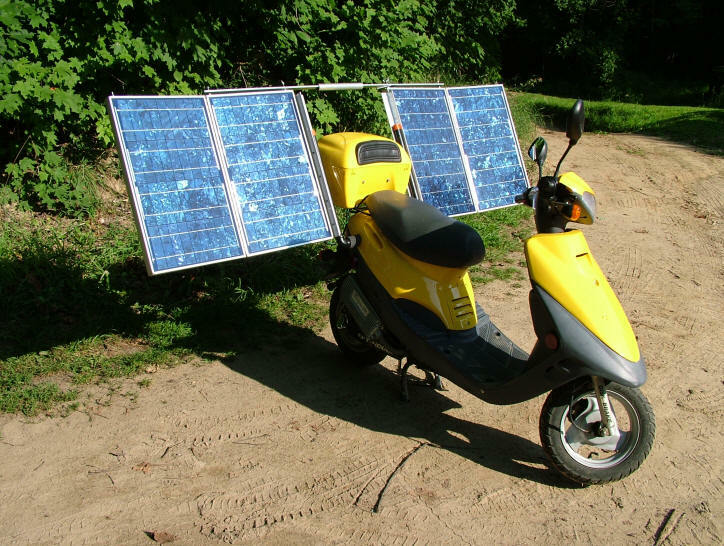 See the link above to see the details on converting the scooter to solar and 8 years worth of riding experience with it. Showing the solar panels folded out for charging. Thanks again to Don for sharing the details on doing the conversion and the updates on how its working out. Hey Gary, it sounds like Don and I are in the same neck of the woods and I was wondering if you would pass along his contact information (feel free to check with him first) to me. It would be neat to talk with him and see what he thinks of some of my projects. Thanks! Don's email is in the actual article on the scooter -- see the link near the top of this blog post.